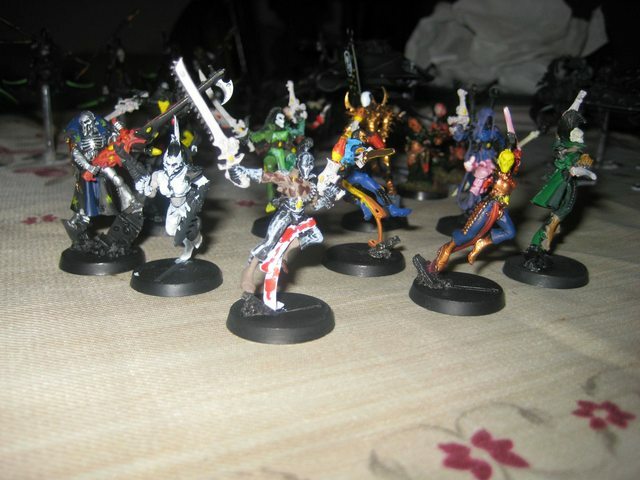 I finally glued together some Harlequins I've had for my Dark Eldar 40k force. They've been sitting about for years now, unmade, but I finally managed to pluck up the courage. 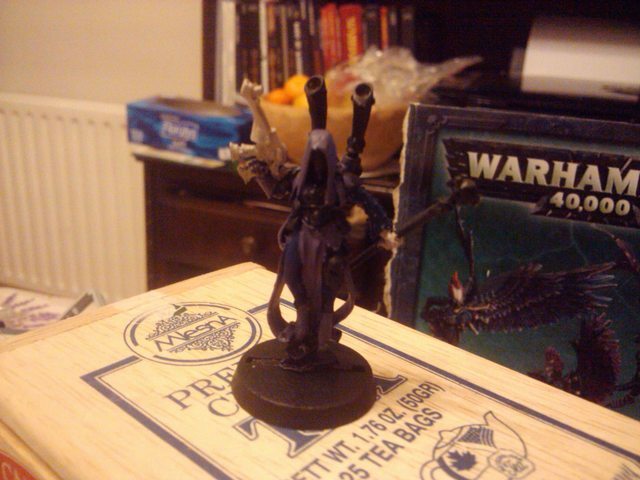 After disconnecting my fingers from them and spraying the remains of my can of Chaos Black Spray onto them as undercoat (alongside my new Incubi who've only been sitting about since February), I am now almost at the stage for properly painting them. 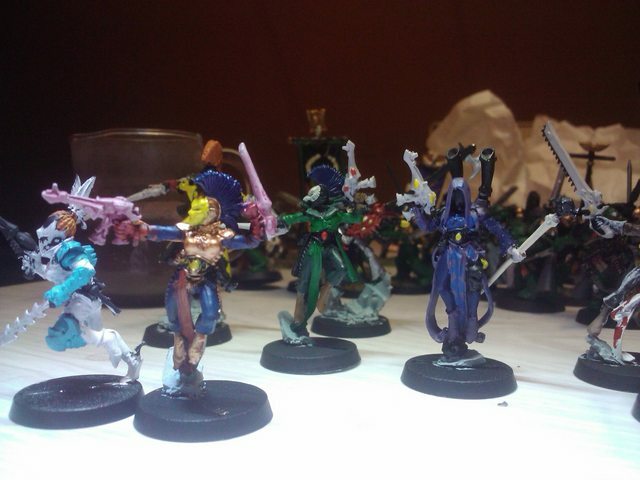 Which leads me to what you might call a problem: I'm an utterly terrible painter. So, there'll be none of this, this or even that. Instead, I'm opting to limit myself to, in the beginning only a few colours. 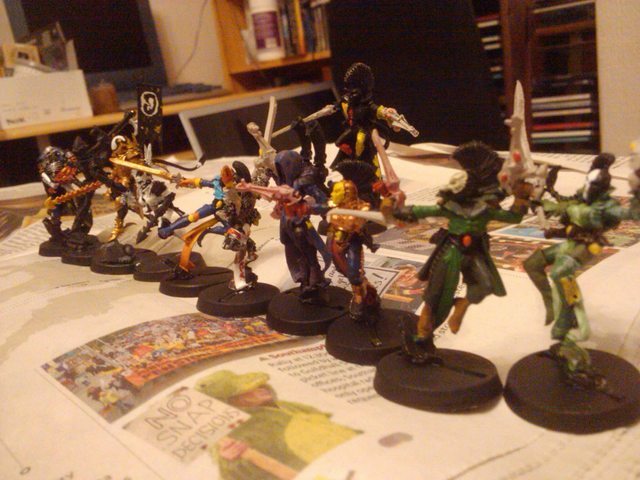 And I'll be painting each individual model in what can only be described as ambitious terms. I won't be painting them as a squad. Nor will I be painting them as individual named characters. Not even special characters. No, think more ambitious. 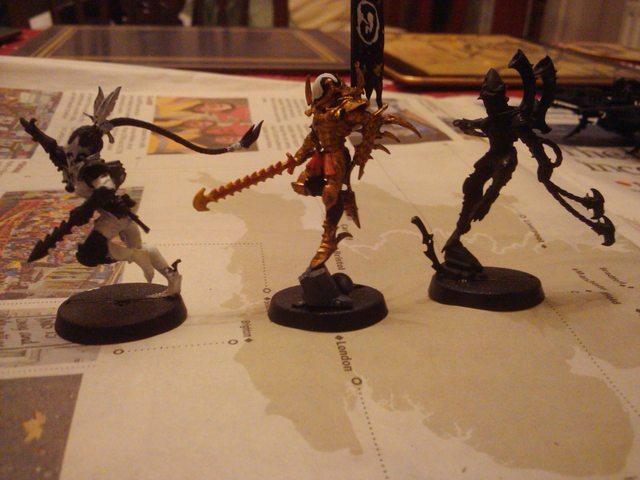 I'll be painting them as abstract concepts condensed onto one model. What will those concepts be? 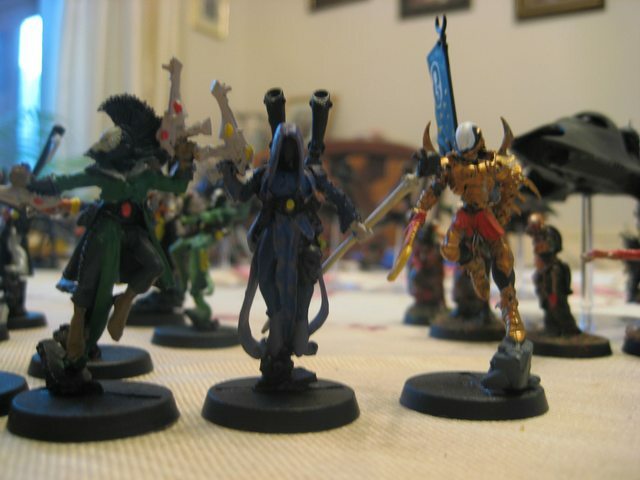 Well, you might have heard of them: they're the Eldar Pantheon of the War in Heaven. 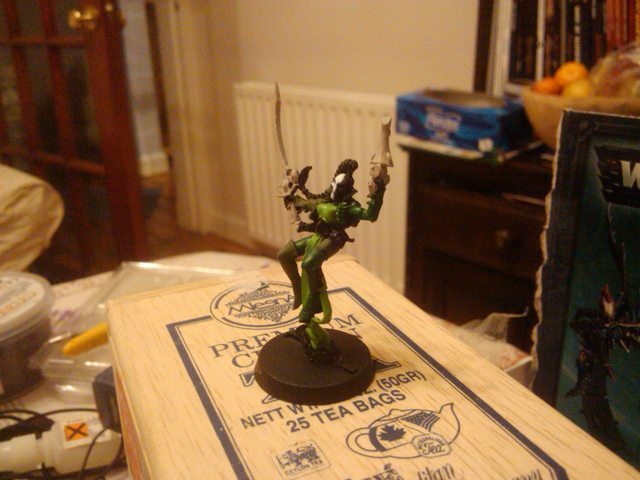 Yes, my Harlequins will be a Masque themed on the Dance Without End. 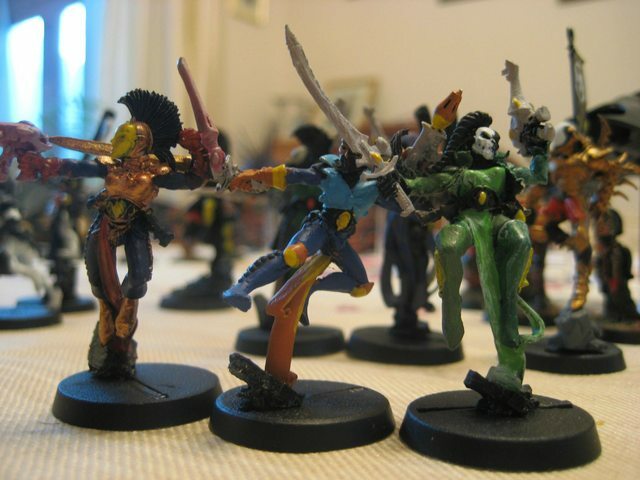 Of course, it won't be the complete Dance, mainly as that'd require at least three sets of full Harlequin Squads (to obtain the appropriate three Avatars [and probably Lelith or a Succubus or Lady Malys to represent the Solitaire]), so it won't be that. 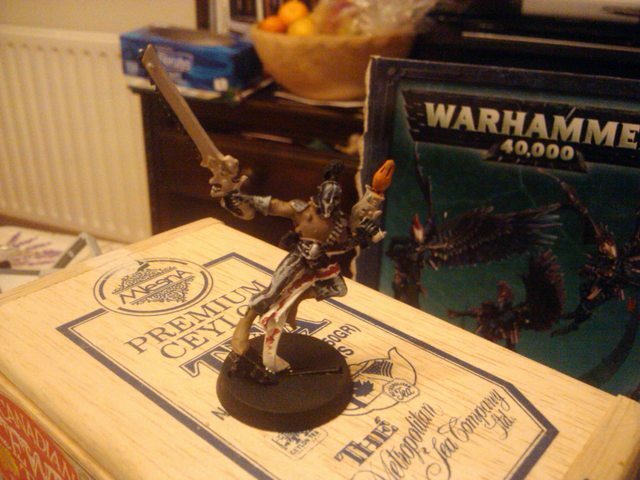 Harlequin with Chainsword & Inferno Pistol: Vaul. Painted in black with grey highlights, like this. As this one also has an odd tie around his thigh, I think I'll try to paint that as a bandage, with blood seeping through and staining much of the leg. Great Harlequin/troupe-leader: Cegorach, traditional 'harlequin' diamonds. Possibly with web- or topological-motifs (Tough!). Shadowseer: Morai-heg. Probably dark with purples/blues. 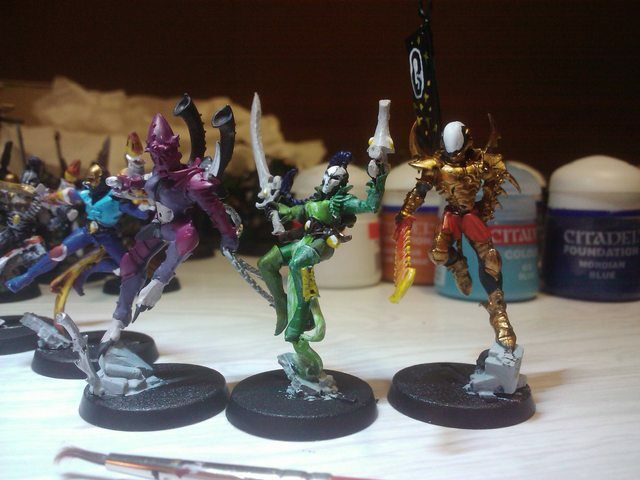 One hand will be painted as Wraithbone. 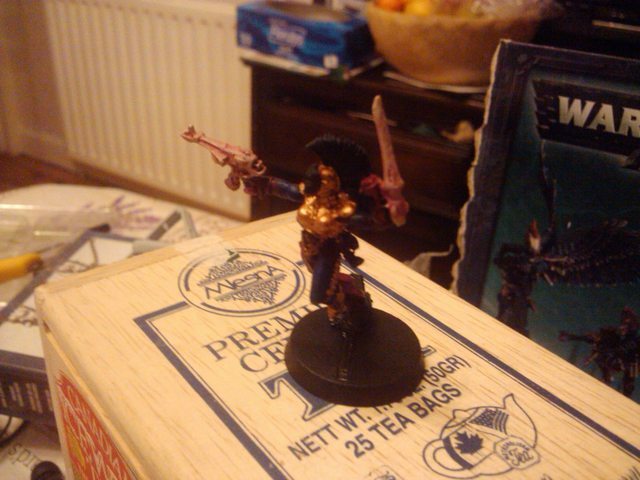 - Khaine: Painted with black suit, brass armour. Also bloodied-looking gauntlets. - Kurnous: Green in many ways, perhaps somewhat leafy. Unsure quite how to perfect it, but ought to be darker than Isha. 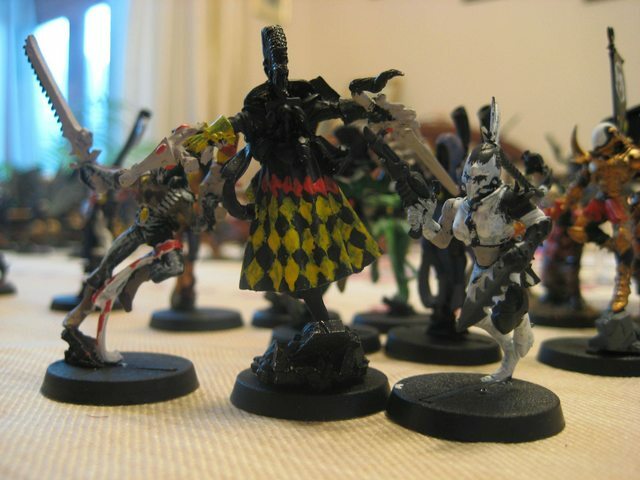 Female Harlequin with normal weapons: Isha. Lighter greens with some other colours as indicating 'life' blossoming. 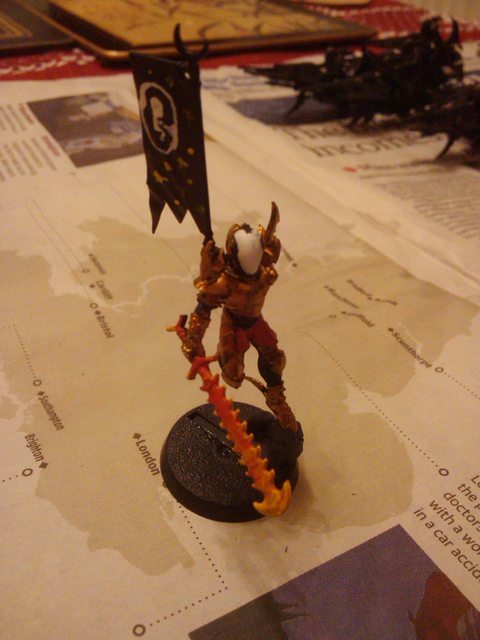 Death Jester: Ynigir. Martian-like red on the weapon grips (Void Dragon), scythey-bone on the weapon barrel (Nightbringer). Golden traceries in some places (Deceiver) and star motifs on the contained sphere of the holo-field projector on his back (Outsider). 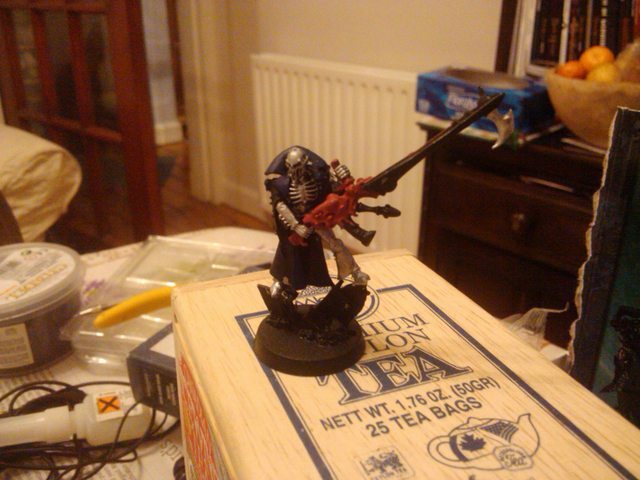 The 'bone' will be silver, as it'd look proper Necrony. 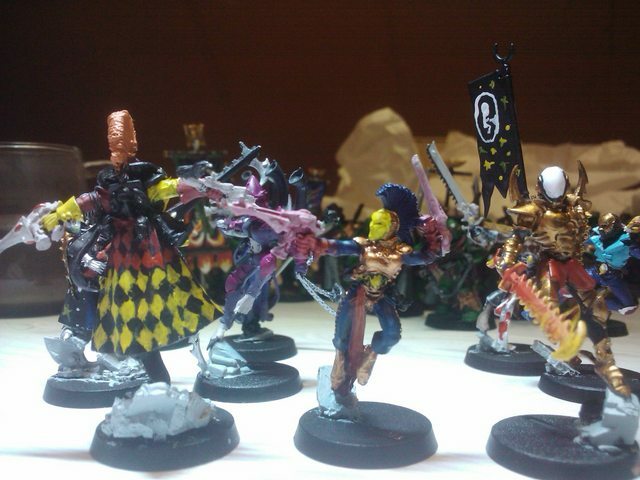 Remaining Harlequin with Fusion Pistol: Asuryan. Painted with flame motifs and golden aspects. I'll update as (if) I make progress. Not sure how that'd be achieved though. 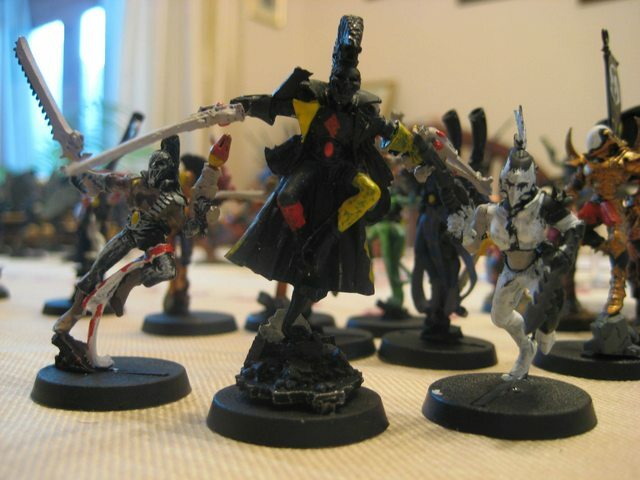 A brilliant idea though, as the harlequins should look like that anyway imo. 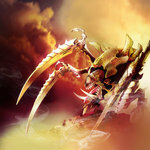 I especially like the death jester concept. hmmm not sure about painting one like Ynigir, even though that suits the Death Jester to a degree, featuring more xeno feel does not sit right, but perhaps that is just me, i'd have thought Khaine could be the Death Jester, what is more Kurnous has always seemed quite minor to the Eldar in ways whereas Asuryan is not he is quite important (so perhaps paint one in the theme of a phoenix. 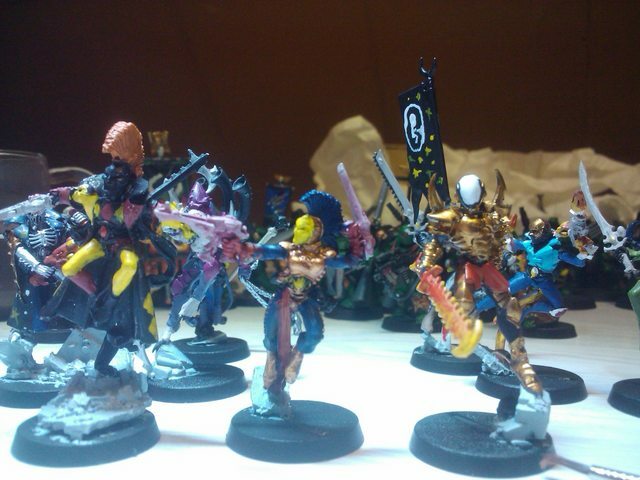 But I cannot really talk as when it came to my Eldar I so far have not painted Harlequinns. Anvil based scenic base perhaps Lucy? 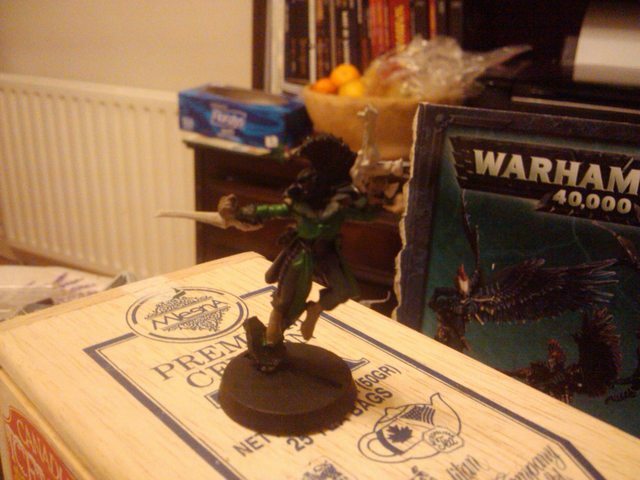 Xisor quick buy the warmaster anvil of doom and balance a harlequin on it. schaferwhat‽ wrote: Anvil based scenic base perhaps Lucy? 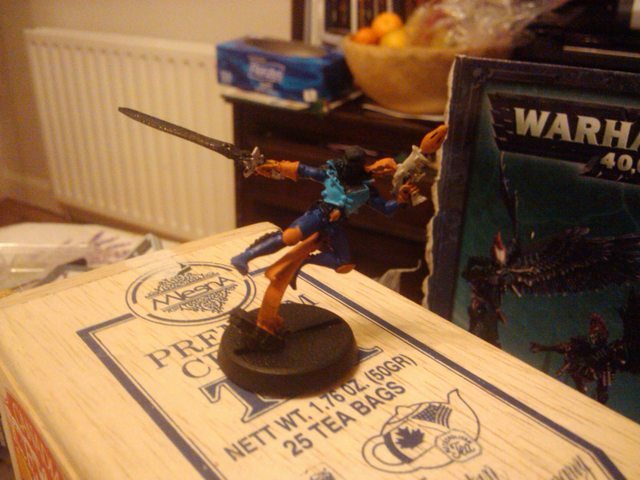 Xisor quick buy the warmaster anvil of doom and balance a harlequin on it. Isn't that un a tad big? could work I suppose. Possibly. Of course, I also have hundreds of dwarfs sat about the house. I might need to voyage to the Lonely Mountain. Yes, hundreds of dwarfs: I'll likely have a decent anvil facsimile on them somewhere. That said, I'm feeling ambivalent about it. I might leave the Anvil as symbolic; it's Vaul's maiming that binds him. The Anvil can be carried through in the idea of pistol (mobile, ranged) and chainsword (fixed, contact) to be the analogy of hammer and anvil. It's loose. Moreover, as said, Vaul's maiming is the important bit. That's the 'chain' to the anvil: he can't be as useful elsewhere because he's been maimed. Anyway, I'm quite excited about this. I might try'n write up some fiction for it. 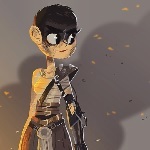 And possibly do some photos/series for my blog. I think I'll reread Matt Farrer's Masks (Faces?) when I can. 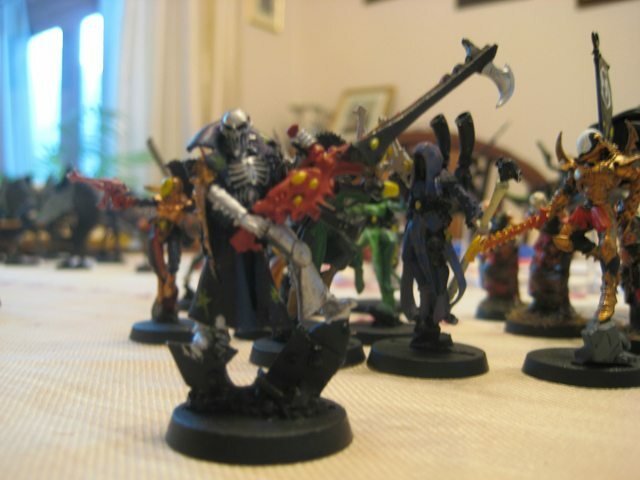 Very interesting, clad that you took on Asuryan and he looks pretty cool, the Death Jester looks ok he makes me feel Kalis Ra (Cannot remember if thats the Nightbringer's name in the Eldar tongue). The only one I am not certain of is Cegorach, he is good, he just does not scream laughing god to me. 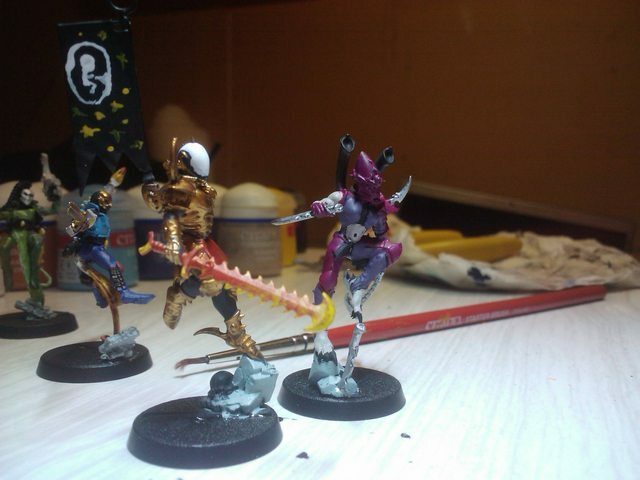 I managed to get a bit more done on them. Not the most awesome shot, but you can see they're coming together more nicely. Managed to play a game with them too, actually. And, perhaps, bought a DE Megaforce. They played well on Wednesday's game, attracting (and wasting) a lot of firepower (thanks to Veil of Tears from Morai-Heg), though only Vaul survived the game. He did, however, blow up a Wave Serpent. Not only that, but he survived the resulting explosion too! 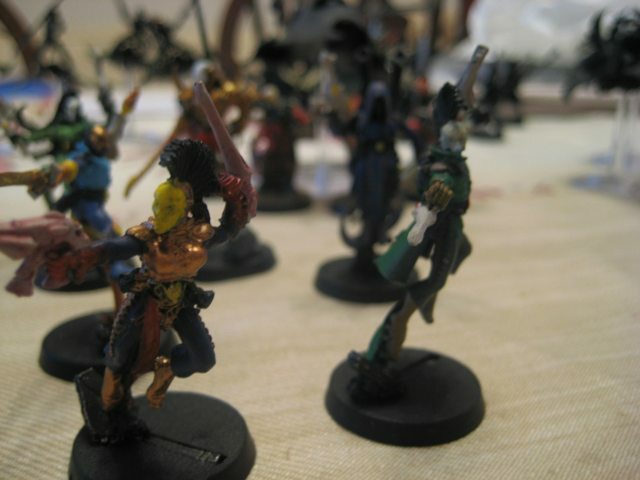 Turns out I really enjoy having Harlequins in my army, even if the game itself turned into a bit of a farce (my abysmal rolling meant almost all of my blasters, heat lances and dark lances missed their targets). Now, I've added two models thanks to my...purchase. Legs come from a running wych, body is the female wych with barest midriff. Arms are taken from a wych (splinter pistol) and the long punch-dagger (to look like a Harlequin's Kiss). This Harlequin's head is, of course, that of the masked, long-haired Scourge solarite head! She'll be painted with skin-tones on her skin and with white/beige/bleached-bone suit. Her face/mask, I'm unsure of, but it'll be nice to see how it goes. Who is she? Lileath, the Maiden. Legs come from one of the Scourges. Armoured, with booted feet, stood up as if taking off backwards, or moving in to a landing. Back is that of the Warrior Sybarite with a plain, thoroughly armoured male front torso. In the Sybarite's 'back hole' is the flag-pole & banner. In right hand is a razorflail which has been tensed into a sword. In the left hand, a hydra-gauntlet (counting as a Harlequin's kiss). The head is the blank helmet from the Reavers box. The sword will be painted with flame motifs. His gauntlet and armour will be bright, golden. The faceplate of his helmet will be blank-white with a hint of black around the edges, the rim of it a shining yellow/non-metallic gold. The banner itself will be painted as a starscape. Upon the starscape will be a white loop. Within the loop will be the simple image of a crude foetus. 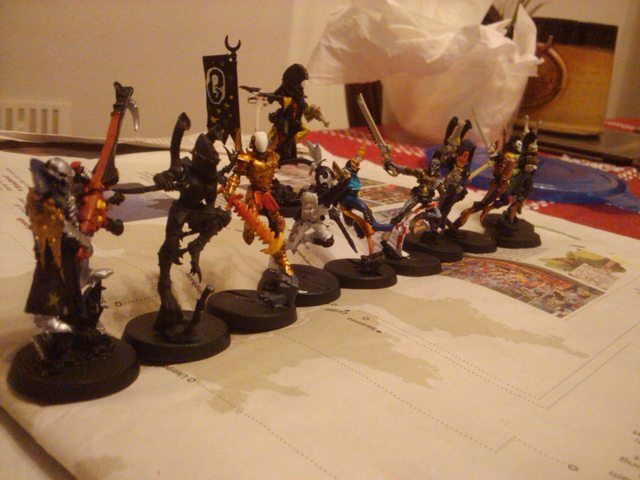 Faceplate: think a Wraithlord or Wraithguard. Pose: Think something along the lines of this...but as if jumping down rather than stepping up. Personally, I'm excited to get painting them. Lost post due to odd midnight forum bumf. Harrumph. 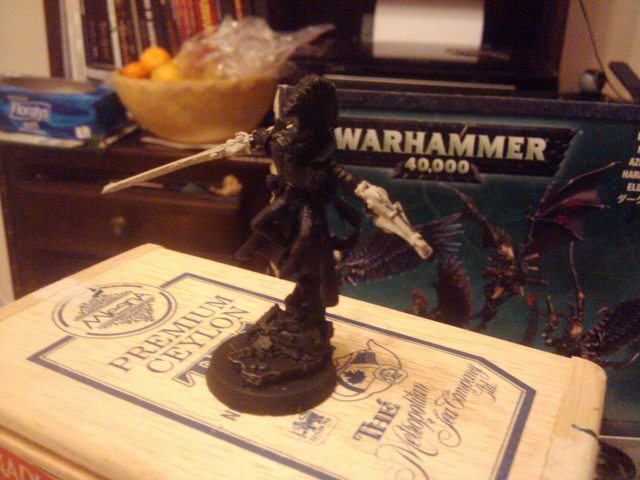 So, who's this new undercoated but unpainted person? That'd be ...well, some folks call it 'Patience'. They look quite nice. The models are the opposite of the SM, they're light and in movement, carrying evil weapons. 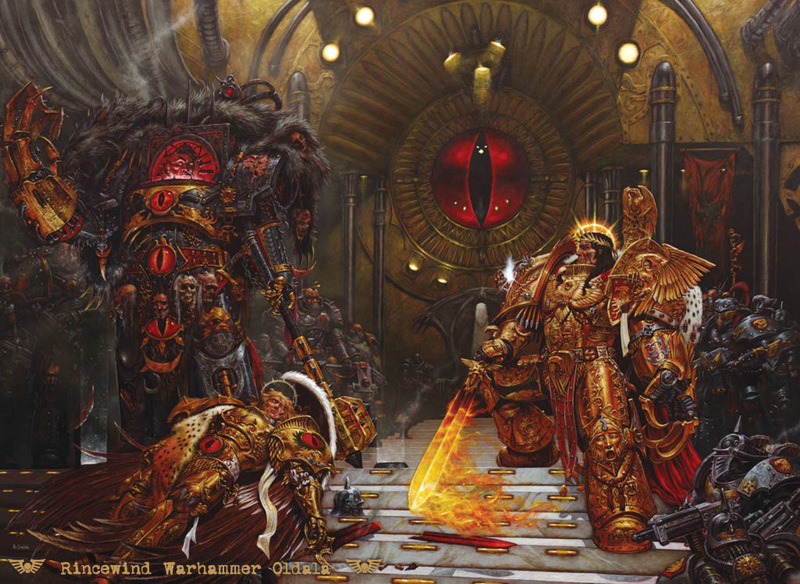 How did you paint the gold/golden armour? It looks more reddish. It is slightly reddish, actually! I'm a massive fan of the actual models/kits for these. The Harlequins have always been cool, the 'modern' ones are particularly lovely. 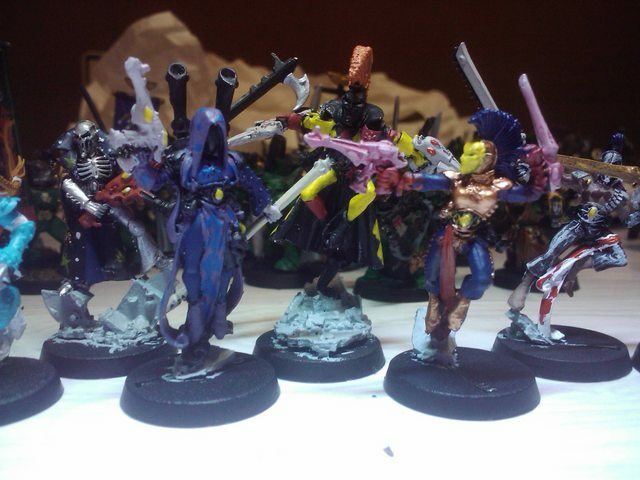 The new Dark Eldar kits (specifically Wyches and Scourges) are so tremendously fun to make. They're deeply, deeply nice kits. Also I drank too much beer and port in the last few minutes. Happy new year! Looking very colorful and vibrant...not to say garish and discordant. 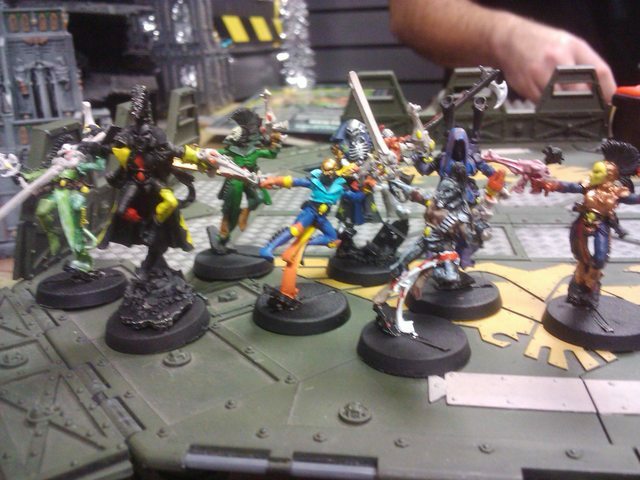 Still, who are we to judge eldar taste in fasion? I'd recommend another coat of yellow on (who I assume to be) Cegorach--the cloak looks decent but the glove and leg are rather thin. Egads, I hate painting yellow on a black basecoat. The Iyanden Darksun Foundation Paint is a real life-saver there--it puts the paint up with Mechrite Red in terms of vying for the most useful Foundation Paint, in my mind. Looking cool. Keep it rolling. Well, I've done a spot more painting on these. Nothing fantastic, but tidying them up and making them a bit more sensible. 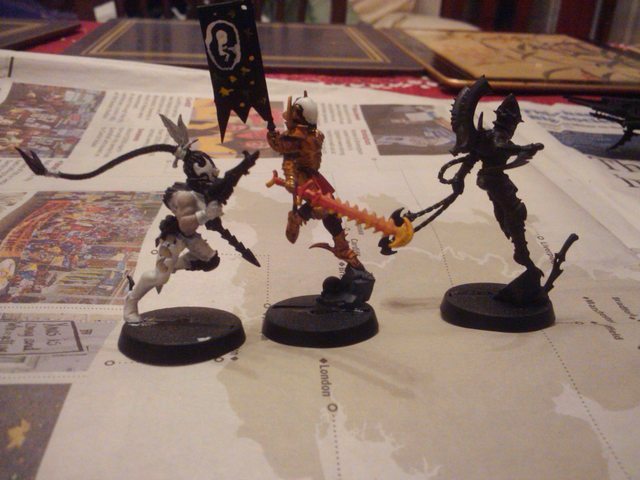 Khaine, Vaul & Asuryan, largely unchanged except for Asuryan's flamey bits. She Who Thirsts, Isha & Ynnead. More colour on Cegorach's coat (still needs more & neater). So, generally, I'm unhappy with the quality of them, but given how shoddy I am (and that they've not been washed/highlighted yet), I think they're coming together rather nicely. I'm liking the Death Jester. I think the metallic/silver, blue, and red shuriken cannon all work well together, in a Harlequiney sort of way. Cheers, Rev. 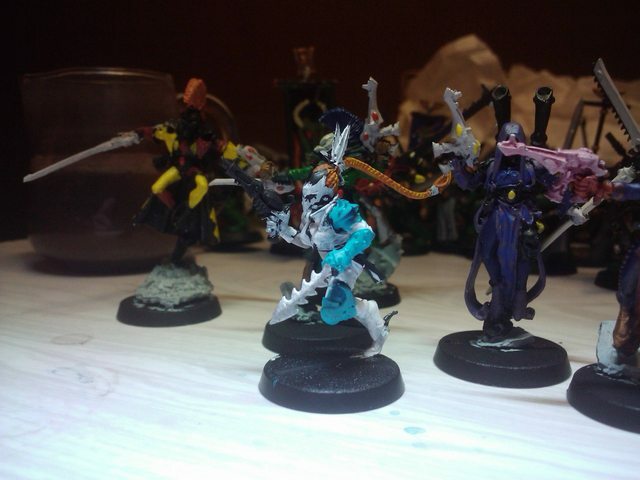 I'm extremely pleased with the outcome for the Death Jester (taking the place of 'The Yngir', the composite C'tan + Necrons in the pantheon). I've also become aware of the last remaining figures isolated from the pantheon: Hoec & Gea, little known Eldar gods with less said about them than even the likes of Lileath or Kurnous. That said, I think I'll convert some up to be the 'final accompaniment' to the squad. 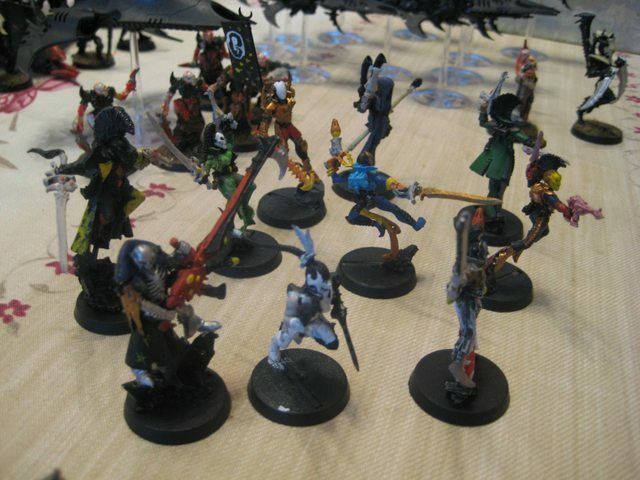 That is: as some Hekatrix Boodbrides, so I can use them all in a Venom as Lelith (Solitaire) and the dregs of the pantheon. However, that means I require a 'final' person to make the three-strong squad. So who'll it be? 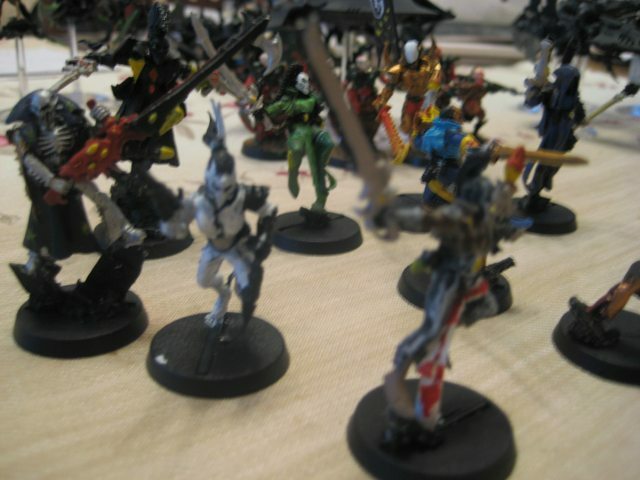 Though I've not included any Mimes, I'm inclined to paint up some Warriors in that style. 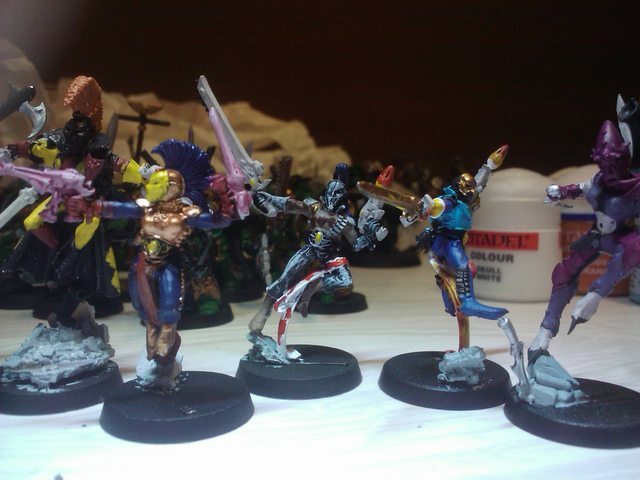 Though we've got Slaanesh as the Solitaire, I'm inclined to make the final one 'Chaos'. Either that or one as Eldanesh (though my image for Eldanesh would be largely the same as Ynnead - indeed, my motif of 'The Emperor' works well for Eldanesh - murdered by Khaine [err, Chaos] to spite the youthful race). But I think a Khornate/Nurgle/Tzeentchian look would work well. The though: big sword (Khorne), Horned Helm (Nurgle) & flame motifs (Tzeentch). There's a slight worry that if I'm not careful with the colours he'd end up looking like a Christmas Tree, but I have nice image in my head of a colouring like how I've done Khaine so far, but without such prominent yellow/red, instead more subtle blues with striking (but small) detail picked out in reds & some diseased-y bits (probably rusted rather than green). Nevertheless, that's the 'last thoughts' on it for now. Have much thinking & painting to do!